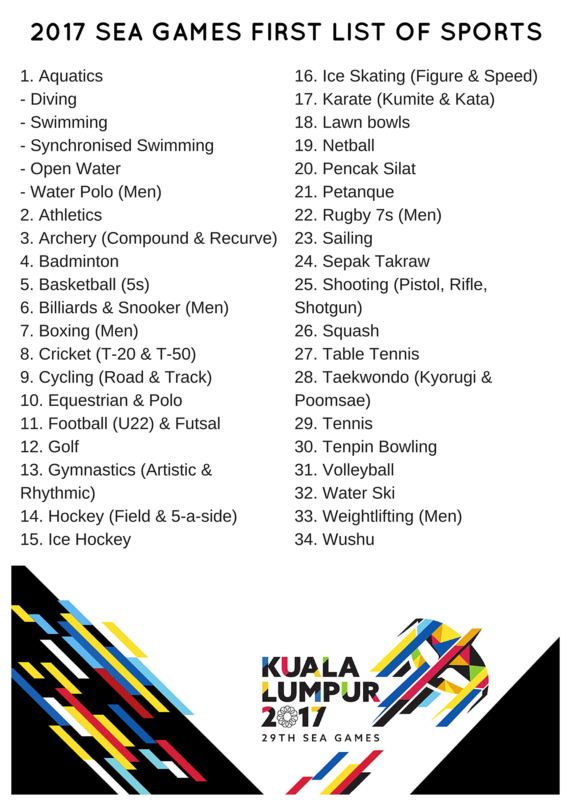 SINGAPORE - The SEA Games Federation Council has accepted the first list of 34 sports that will be contested at the 2017 SEA Games in Kuala Lumpur. This was announced by Olympic Council of Malaysia president Tunku Imran at a media conference following the meeting. The Council had met over two days in Kuala Lumpur to discuss issues that included the sport programme for the next edition of the biennial affair. Among the notable inclusions: ice hockey and ice skating (figure and speed) will be contested for the first time. Cricket has also been included. Canoeing, fencing, judo and triathlon have been culled while events such as the marathon, 10,000m and the 3,000m steeplechase has been provisionally cut from the athletics programme. Athletes, including Singapore's own 2013 marathon champion Mok Ying Ren, have responded with online petitions asking for the reinstatement of these events. The list of sports for the Aug 19-31 event will be finalised in June.